Popular culture in Ireland is much like anything one would see on the television or in books in regards to other countries. One thing that truly sets the culture in Ireland aside from that in America, however, is the pubs. While it is widely recognized that Ireland has a bit of a problem with the over-consumption of alcohol, pubs are quite different in Ireland than they are here in America. In America, a pub is simply a place to drink. In Ireland, however, it is a meeting place. A pub is the first place people would go to eat, drink, and catch up with old friends, somewhat our equivalent to a coffee shop. Another factor that lends itself to Irish tradition and culture is immigration. For many years more people left Ireland than those that came there, which is referred to as emigration. However, this has changed since the late 1990s and the Irish economy has greatly improved as a result.The 1990’s also brought about a growing trend of the previous emigrants of Ireland returning to their homeland, resulting in a richer cultural diversity in the once “straight across the board” Ireland. Because of this, we now see culture from other parts of Europe especially slowly beginning to integrate into that of Ireland, bringing about subtle changes and creating more of the “melting pot” environment that we often see showcased in America. Another important component in Irish culture is religion. According to the most recent census 78% of people identified as Roman Catholic. The next closest religious viewpoint was non-religious people who made up 10% of the population. These numbers have changed dramatically over the past 15 years. In 1991 92% of the population identified as Roman Catholic and only 2% of the population identified as non-religious. Despite the fall in religious practice, Ireland’s culture is still heavily influenced by religion. For example, the Irish laws are influenced by Catholic tenets. Two important Catholic tenets that appear in Irish law are their views on divorce and abortion. In Irish law it is currently extremely difficult to get a divorce. This is because of the Catholic Church’s stance on divorce. In order to get a divorce in Ireland a couple must be able to show they have lived apart for 4-5 years. Furthermore, abortion is considered illegal in Ireland no matter the circumstances because of the laws enforced by the Catholic church. Despite the constant negative presence of the Catholic church in Irish Culture. The church has given positives to culture in Ireland and influenced other cultures. For example, the Celtic festival “Samhain” is supposedly the origins of Halloween. Another holiday that has origins with the Irish is St. Patrick’s day. St. Patrick is commonly seen as the Saint patron of Ireland. St. Patrick’s life is celebrated in the United States with green alcoholic drinks but in Ireland they see March 17th as a religious holiday of remembrance. Hofstede’s cultural dimensions analyze six cultural dimensions of specific cultures: power distance, individualism versus collectivism, masculinity versus femininity, uncertainty avoidance, time orientation, and indulgence. In “What About Ireland” by Gert Hofstede, the scores of Ireland’s society for each one of the dimensions is discussed, the first of which is power distance. Power distance refers to the tolerance of inequality in a society.. In this category, Ireland scores a 28, illustrating the low tolerance of inequality among the Irish people. According to Hofstede, the chain of command within organizations is established for the convenience of having someone to report to. Managers are easily accessible to employees, and communication between employees and managers is often informal and participative. In power distance, the United States scores a 40, which portrays its low tolerance for inequality as well. Although the U.S.’s score is higher than Ireland’s, managers are still easily accessible, and the organizational hierarchy is primarily established for convenience. Bosses still utilize participative management to a degree, but not as much as Ireland managers do. If you are planning on opening a restaurant in Ireland, you would not have to change your management style very much. You would simply want to tweak it to include employees in managerial decisions and creating goals for the employees. The next cultural dimension is individualism versus collectivism, which analyzes who or what individuals feel responsible for. While people of individualistic cultures feel responsible primarily for themselves and their immediate families, people of collectivistic cultures feel a responsibility to the society. 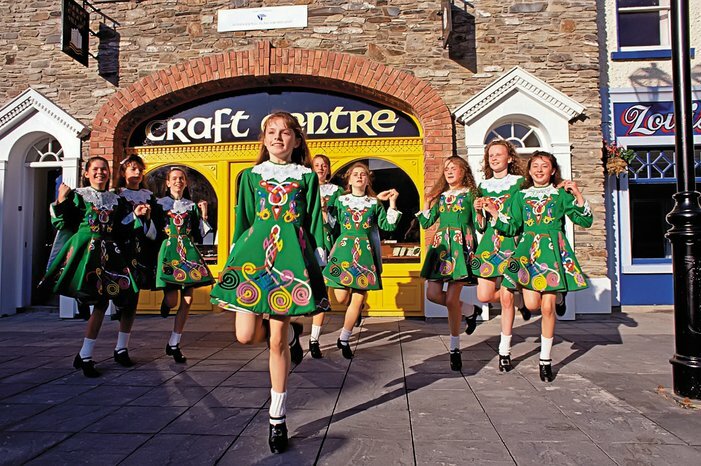 In this area, Ireland has a high score of 70, meaning that they are a highly individualistic culture. In an organizational sense, this means that managers expect employees to take initiative and be self-reliant. Irish employees aim to be the best at what they do, and superiors respect their hard work and dedication. In return, they base hiring and promotions on merit, skill, and experience. Similarly, the United States maintains a high individualist score of 91, making it one of the most individualistic countries in the world. Luckily for Americans wanting to open a restaurant in Ireland, the individualistic tendencies will be very similar. The Irish people put themselves first before their society, and the government helps protect your individual rights similar to that of the United States. You as an individual business owner are valued and protected. In the next category, masculinity versus femininity, the United States and Ireland are extremely similar. This cultural dimension analyzes the values of the culture and whether they tend toward masculine qualities or feminine qualities. Ireland scores a 68, making it a masculine culture. This means that the Irish people value qualities such as competition, achievement, and success within their organizations and their everyday lives. The Irish tend to be very proud and boastful of their successes, and they are always striving to be the best that they can be to achieve a high status. Comparatively, the United States scores a 62, making it very similar to Ireland in this dimension. In the United States, the goal is to win, and competition is encouraged in organizations and life. Being high in masculinity is extremely good for the restaurant industry. It will encourage you to be competitive within your industry, always working to improve both prices and quality of your food. The fourth dimension, uncertainty avoidance, looks at how a culture deals with ambiguity and being unsure of the future. According to Hofstede, Ireland has a low score of 35 in uncertainty avoidance. This indicates that the Irish are okay with uncertainty, translating to their welcoming of fresh ideas and imagination. They enjoy being creative, and they do not feel that it is necessary to have a plan that is set in stone. On the other hand, the United States scores a little higher on this scale with a 46. While the United States accepts new ideas and innovation, the terrorist attack of 9/11 has culminated uncertainty in the American people about both their futures and their government. While being slightly fearful, Americans do continue to appreciate ideas and opinions, and they do not require strict schedules and rules. As a new restaurant owner, Ireland is the place to go considering their love of creativity and innovation. They would appreciate fresh ideas and the entrepreneurship that you are offering to the restaurant industry. The next cultural dimension is long-term versus short-term orientation. Both Ireland and the United States score very low, Ireland with a 24 and the United States with a 26, indicating that they are long-term oriented. For both cultures, this means that they respect tradition and view change as somewhat suspicious. Although both cultures are long-term oriented, they do not feel a strong motivation to save for the future, and they strive more for quick results rather than achieving long term goals. If you are becoming an expatriate in Ireland, it will be easy to adjust to their time orientation because it is so similar to the United States. An expat may simply want to be more diligent about saving money and planning for the long term. The final cultural dimension is indulgence. The score for indulgence indicates the degree to which the people of the society try to control their materialistic desires. Once again, both the United States and Ireland score similarly. Ireland scores a 65, and the United States scores a 68. This portrays that both countries tend to be indulgent rather than restrained relative to their desires. Both have a mentality of “work hard, play hard,” and they both believe in having fun and treating oneself. If you are opening a restaurant in Ireland, make sure to play into the desire that the Irish have to enjoy life. Make your restaurant an enjoyable place that customers can kick back, relax, and have a good time. While Ireland shares many of the same Cultural aspects as the United States, there are also some formats of cultural difference that we should take into account in relation to starting a restaurant. While the United States is extremely focused on timeliness, Irish locals are far more laxed in this manner. It is common for people to set times to meet and show up later than they accounted for, this could make restaurant reservations and operating hours more difficult to regulate. Time takes a backseat in the Irish culture, while the Irish people have a focused approach professionally their personal time is rather nonlinear unlike the United States. Social mannerisms in Ireland are also rather different when we compare them to the United States. While in America it is considered respectful not to invade personal space, the Irish culture commonly ignores this American norm. It is very common not only to be greeted by strangers, but also to be greeted with handshakes, hugs, and other forms of direct contact. Irish greetings whether in a professional or social setting are commonly warm, affectionate and intended to be very personal. The Irish culture tends to live more in the in the moment and in harmony with their direct environment, while they believe in the idea of “work hard, play hard” their personal happiness takes the reins when referring to their quality of life. While there are a few aspects of cultural difference between Ireland and the United States they are still very similar in the format of language, business structure and organization. These similarities would allow future business ventures in Ireland to take place rather smoothly. The cultural distance between the two are more socially driven than they are professionally. While there are some differences in managerial and leadership roles, both cultures operate on the basis of a focused chain of command, and the delegation of workforce roles and responsibilities. Similarities such as these should be a huge focus as we make our decision to expand and operate into Ireland. Because of the similarities found in Hofstede’s cultural dimensions, an expatriate in Ireland would easily be able to assimilate to the Irish culture. The importance of having fun and enjoying oneself is extremely important to the Irish, and American business person could easily profit off of a fun pub where locals can come to kickback and relax. However, more factors need to be taken into account to assess the distance between Ireland and the United States. The different mannerisms and concepts of time may be difficult for an American to become acclimated to. As long as you have an open mind to doing business in another country, these mannerisms and norms should not be difficult to learn. Considering both countries are “melting pots,” we are used to marketing and catering businesses toward many groups of people. The Irish are accepting of different ethnicities and cultures, which is extremely important when thinking about opening a restaurant there because you want to be accepted as a business owner despite being from a different country. This accepting culture would be a profitable place to own a restaurant, specifically a pub. Considering the heavy influence of religion on Irish culture a restaurant would be ideal in Ireland. The Irish people’s commitment to religion shows their priorities and moral compass are in line. This creates the sense of comfortability that is necessary in the restaurant industry.